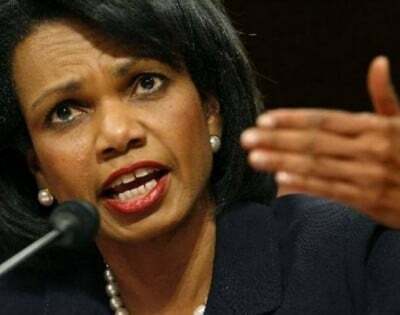 "The Virtual Inventor of the “IS” is none other than Former U.S. Secretary of State Condoleezza Rice"
The most severe crisis in the Middle East to date, the coming to power of the “Islamic State” in Iraq and Syria has entered an extremely absurd phase. The European states are about to follow the lead of the U.S. by exporting arms to the Kurdistan Regional Government under the command of Mustafa Barzani.This is being justified as “humanitarian aid”. They allegedly want to help preventing the genocide against the Yazidis. Accompanied by strong media presence, the German foreign minister Frank-Walter Steinmeier visited a family of Yazidi victims. He intended to illustrate the suffering of the Yazidis and the impending genocide in order to manipulate public opinion towards accepting the supposedly exceptional situation of the necessity of German arms exports into a crisis region. The German government and other governments in the West in conjunction with their mass media are giving the strong impression that arms transfers to the Iraqi Kurds is the only possibility to prevent the impending catastrophe. All the other short- and long-term alternatives have not even been taken into consideration. All indications put forward by experts regarding the dramatic consequences of military support of the Iraqi Kurds are being systematically ignored. Therefore, Western governments raise the suspicion that humanitarian motives to protect the Yazidis merely constitute a fabricated pretext to enforce their own interests. The U.S. is taking advantage of the incontestable threat posed by the brutal “IS” combatants in order to polish their damaged image in the Middle East and simultaneously try to underline that their further military presence in the region is indispensable. At the same time, the virtual inventor of the “IS” is none other than former U.S. Secretary of State Condoleezza Rice. In 2006, during the peak of the U.S.–Iran conflict, she prompted all Sunni states to set up a “Sunni belt” in response to the alleged “Shia belt” that Iran had supposedly created against Arab Sunnis. Henceforth, the Lebanese government received military aid with the explicit purpose of containing Shia Hezbollah in Lebanon. Then the Secretary-General of the Saudi National Security Council, the infamous Prince Bandar bin Sultan, set to work. The results were the birth of brutal groups such as Al-Nusra Front and “ISIS”, which sprang up like mushrooms to fight the Assad regime in Syria. In the final analysis, the outcome of the 2006 Condoleezza Rice plan was also the creation of the barbaric “IS” group, which is unprecedented in the entire history of Islam. Especially since the beginning of this year, the German political élite are agitating for “more responsibility” in world politics. For this purpose, they want to soften restrictions with regard to arms transfers to crisis-hidden regions as well as remove parliamentary barriers to so-called humanitarian interventions. Since then, there have been massive attempts to eradicate moral objections from the collective memory of Germans to be able to participate in future global military conflicts without any restraints. As a result, the impending genocide against the Yazidi minority in northern Iraq was skillfully built up to be the number one issue by influential media outlets. The credibility of the humanitarian motives of the German government can be measured by the fact that the same government did not say a word about the atrocities of the Israeli government in Gaza which was taking place at the same time. There is silence about the suffering of the Palestinians but the suffering of the Yazidis is being exploited for their own policies. This is a terrifying hypocrisy. By dint of Western arms transfers, Iraqi Kurds will proclaim a Kurdish state in northern Iraq and consequently split Iraq into several parts. The fact that some weeks ago Israel announced that it would immediately accept a Kurdish state should give us cause for concern. The claim to be the sole representatives of a Kurdish state made by the Barzani leadership, who follows the concept of Kurdish nationalism, would inevitably evoke reactions from Kurds in Turkey and Syria who are under the influence of the Kurdistan Workers’ Party (PKK). Not least because meanwhile the PKK rejects a Kurdish national state and obviously pursues the aim to create autonomous Kurdish regions within the existing states of Turkey, Syria, Iraq, and Iran. A civil war between Kurds would be best suited to provoke a war between the four states at hand and to bring nationalist currents into the arena. It is obvious that under such circumstances, the brutal supporters of the “Caliphate” would not be weakened. By contrast, they would find ideal conditions for building their “Caliphate” and “Islamic State” (the Western media carefully abstains from using quotation marks) in the heart of the Middle East and would henceforth frighten all its states and peoples, including numerous ethno-religious minorities. The German and European arms fetishists are walking right into the trap of those U.S. neoconservatives who long ago set this trap in conjunction with their transatlantic puppet masters, when they sell arms to the Iraqi Kurds. To put it bluntly: I think that these arms transfers would be the most imprudent thing that the Europeans could do in the name of “humanitarian intervention”. Nobody knows whether we can prevent the German and other European governments from committing such stupidity. Regardless of this, it is primarily the four affected states themselves that have a common interest in fighting the cancer of the “Islamic Caliphate”. This “Caliphate” is massively steered from abroad and it threatens all religious and ethnic minorities – the Yazidis of Iraq and Turkey, Christians across the Middle East, the Alawites of Syria, the Alevites of Turkey, Shias of Iraq, Iran and other parts of the Middle East, as well as Kurds of all four countries. Even the majority of Sunnis who resist the policies of the “Islamic State” would be in danger. It is especially a disgrace for the Islamic states in general – and it casts a gloomy cloud over the positive civilizing achievements of tolerance, the protection of minorities and the peaceful coexistence of different peoples and religions within the Islamic world. Most importantly, it is only the four most affected states themselves – Iraq, Iran, Syria and Turkey – which are in a position to end the “Caliphate” project through common efforts. The challenge that is currently being posed by “IS” also proves how important it is for the four affected states in the Middle East to act beyond short-term national interests, to cooperate in security matters and to generate a common security framework. Beyond putting an end to the “IS” challenge, only such a perspective allows them to solve common cross-border problems in transnational dialog and negotiations. Apart from “IS”, the Kurdish question poses the most significant common issue of the four states. Within the scope of a joint regional security framework, the Kurdish dream of more administrative autonomy could be realized by dint of direct dialog and negotiations without violating the territorial integrity of the four states’ Kurdish settlement areas. Since the beginning of the 20th century, this unsolved problem has provoked numerous bloody wars and permanent domestic conflicts. Therefore, the Kurdish population deserves a lasting peaceful resolution. This could be facilitated if the four states negotiated with all Kurdish movements. Apart from the Kurdish question, there are other broad transnational issues such as the extension of energy and water supply, the development of transport infrastructure, the liberalization of trade and many other projects that can be regulated via the cooperation of the four states in order to increase the social security and welfare of the region. No less important is the fact that the four states could succeed in ending the damaging interventions of the U.S., Israel and other states and create the conditions for a peaceful and economically prosperous Middle East even beyond the frontiers of the four states, providing that they are willing to act in concert. Translated from the German original – entitled “Die Bekämpfung des sogenannten »Islamischen Staates« liegt allein in der Hand der betroffenen Staaten” [Fighting against the »Islamic State« solely lies in the hands of the affected states], NachDenkSeiten: Die kritische Website (Germany), 29 August 2014 – by Kaveh Yazdani, and edited by Ali Fathollah-Nejad.